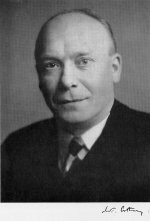 A year after his first meeting with Landsteiner, Pauling was visited by another major influence: William Astbury, a British expert in x-ray crystallography. Astbury had established himself as an important protein researcher a few years earlier, in 1930, by studying the molecular structure of wool. He was expert in using a system Pauling also knew well, x-ray crystallography, to get an idea of what wool was at the molecular level. Wool was stretchy, and he examined that property under his x-ray camera, looking at fibers of wool both stretched and unstretched. He believed that the molecular structure changed when stretched. Wool was made of a class of protein called keratin, which also makes other types of hair, as well as horn and fingernails. Astbury had in the early 1930s pioneered the field of keratin x-ray studies, showing that wool and other keratin fibers had a regular, repeating structure – a crystalline structure – and postulating that this structure was formed from long-chain polypeptides held somehow into a specific form. Astbury called what he was seeing "molecular yarn." His x-ray pictures were too fuzzy to yield a precise reading on the structure of the yarn, but he thought the data indicated that keratin in native, unstretched wool was folded into a sort of kinked ribbon shape. When the fibers were stretched, the kinks were pulled out into a straight chain. He found the same pattern changes in muscle fibers. He saw keratin-like patterns in many other proteins as well. Perhaps, he thought, keratin was the key to a basic property of all proteins. Perhaps, he said, keratin was "the grandfather of all proteins." Pauling had carefully tracked Astbury's publications about long-chain protein molecules folded into specific shapes. When Astbury visited Caltech in the spring of 1937, they sat down and talked. Both men agreed that keratin was a long-chain molecule, but they disagreed on the finer points of structure. Something about Astbury's flat, kinked ribbons did not fit with what Pauling knew about protein chemistry. "I knew that what Astbury had said wasn't right," Pauling said, "because our studies of simple molecules had given us enough knowledge about bond lengths and bond angles and hydrogen-bond formation to show that what he said wasn't right. But I didn't know what was right." See Also: Letter from Linus Pauling to Warren Weaver. July 29, 1936. See Also: Letter from William T. Astbury to Linus Pauling. February 17, 1937. See Also: Letter from Linus Pauling to William T. Astbury. March 4, 1937. See Also: Letter from William T. Astbury to Linus Pauling. March 19, 1937. See Also: "Astbury - Tropomyosin Actin" August 12, 1956. Portrait of William T. Astbury. 1950s. 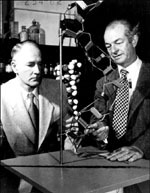 George Beadle and Linus Pauling examining a skeletal model of a polypeptide chain, California Institute of Technology. 1952.